NetdesignHost Review 2019: Is NetdesignHost a Good Hosting? I signed up to NetdesignHost, reviewed their unique features, tested how easy they are to use, checked with support on several issues, and tested the speed of the live site. When done, I tried to cancel my account and receive a refund. This is my experience with NetdesignHost - I hope you can learn from it. NetdesignHost is a trusted hosting solutions provider in Thailand. Since they launched in 2001 they have acquired more than 5000 customers including government departments, businesses, and personal brands. Their fairly priced hosting plans can accommodate both low and high capacity hosting needs, and they also offer VPS and reseller plans. The NetdesignHost website can be switched between Thai and English, but I got the best results by switching to English AND applying the Google Translate tool in my browser. You don’t get a free domain on any of the plans, but that’s acceptable considering the other features they provide. On the private host (VPS) you can set up automatic backups for a fee, but on the shared plans you have to configure your backups manually. Those backups – and data transfer in general – are speeded up by NetdesignHosts’s Dell R630 servers and 10 Gbps port speeds. The top plan gives you unlimited MySQL databases, and you get five on the base plan, so setting up multiple applications shouldn’t be a problem. Beginners can use the one-click installer to set up several CMS systems including WordPress, Joomla, Drupal, Magento, and OpenCart. Experts may be disappointed to discover that PHP is only supported on the shared hosting plans. You can use ASP.NET on the VPS plans. Given that NetdesignHost is a part of the much bigger Z.com mother brand, and your hosting is managed there, you can use their ShopUp paid package to set up and manage your e-commerce website. Setup time for this and every shared web hosting package is just a few seconds! NetdesignHosts’s shared hosting plans are fairly priced, and even the slightly expensive Plan L doesn’t come with a surprise surcharge at renewal time. The VPS private servers are also cheap. There is no monthly payment plan, so you have to pay for one, two or three years (with up to 20% savings). 24/7 customer support is available via phone, email or live chat, with the latter option providing rapid relevant responses. They also have a help center packed with in-depth tutorials. NetdesignHost provides fairly priced shared web hosting packages with beginner-friendly features and optimized servers. On the minus side, their uptime is only 95% and programming languages are limited. 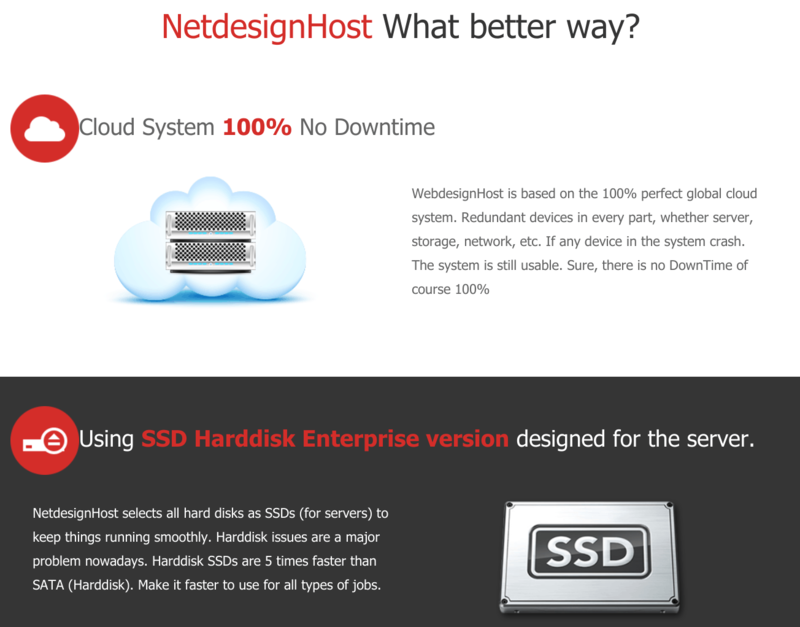 Wondering how NetdesignHost stacks up against other Web Hosting companies? Enter any other Web Hosting company and we will give you a side-by-side comparison.